In her projects, the Spanish-born artist Lara Almarcegui, who lives in Rotterdam, examines processes of urban transformation brought on by political, social, and economic change. 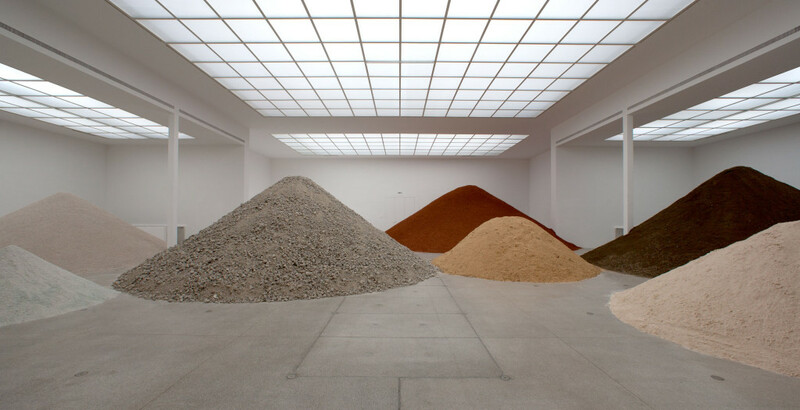 Since the mid-1990s, she has studied urban features that are not usually the focus of attention: wastelands, construction materials, invisible elements. In her first solo show in Austria, Lara Almarcegui has created three new works for the Secession that relate closely to the city of Vienna and to the historic exhibition house while also recurring to earlier works the artist developed in various cities all over the world. Lara Almarcegui frequently works outdoors. She has already implemented numerous international projects, from the restoration of a market hall slated for demolition in San Sebastián (Spain) to close studies of derelict lots in Rotterdam, Bilbao, São Paulo, Lisbon, and Amsterdam. She collects historical, geographic, ecological, and sociological data about vacant areas in the urban space that will soon have changed, documenting them and interviewing experts. “One wasteland has very different characteristics from the next. I try to present each site in as much detail as I can, zoom in a lot, try to present the uniqueness of each site.” Lara Almarcegui bundles the information she gathers in Guides, brochures that present the past, present, and future of the vacant lots—some had been put to public, some to private uses—in an objective and matter-of-fact fashion. Like her other Guides, the brochure Brachflächen am Nordbahnhof, Wien / Wastelands at Nordbahnhof, Vienna, steers clear of romanticizing any sort of patina, of a sentimental view of the past. The derelict areas Lara Almarcegui studies are located on the grounds of the Nordbahnhof railway station in Vienna’s 2nd district. Once the Habsburg monarchy’s largest and most important railway station, the Nordbahnhof sustained massive damage in World War II; it was finally demolished in the 1960s. Where a paraffin depot and old coal-yards stood, nature is now slowly reconquering the land. According to the general development concept for the area from 1994, a request for proposals for detailed urban development plans will be issued in 2012. The concept calls for the creation of residential buildings, while part of the area will be retained as recreational green space. In her Guides, Lara Almarcegui documents the current undefined state of an area in transition. “I always think it is good to know what is going on in urban planning in a city. Wastelands are important because they are the only places in the city that remain without definition. Untouched by design, everything that takes place in them happens by chance and not according to a plan. […] I see great value in this lack of a design, and that is why I would like to ‘preserve’ these wastelands in my works, if that is possible and makes sense,” the artist says. 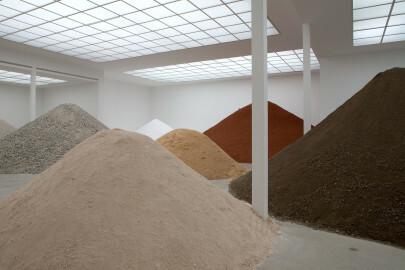 Lara Almarcegui renders visible what we otherwise fail to regard, see, or notice. She deconstructs in order to uncover—including a view of the utopia of the future. 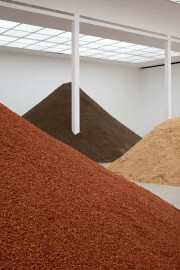 In Bauschutt Hauptraum Secession / Construction Rubble of Secession’s Main Hall, Lara Almarcegui takes stock of the construction materials used to build the main hall of the exhibition building by heaping up piles of these materials—all products of recycling processes—a work that also considers a vision of a possible future use. The exhibition hall with its aura is transmuted into shapeless heaps. What would happen with these tons of concrete, wood, terrazzo, brick, mortar, glass, plaster, polystyrene, and steel if they were to return into the circulation of the construction industry? Which new constructions might arise out of the materials that now constitute the Secession’s main hall? 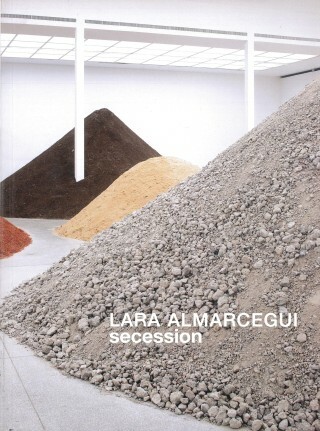 Lara Almarcegui’s work for the Secession represents an elaboration of earlier works. 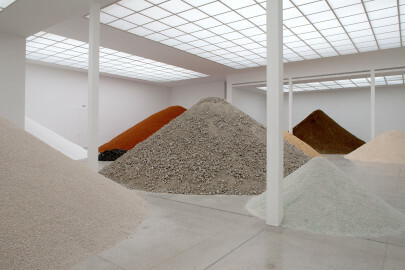 In 2003, she analyzed the FRAC building in Dijon, representing it with new materials. In 2006, she calculated the total amount of various construction materials in the entire city of São Paulo, exhibiting the results as a chart during the São Paulo Biennial: a condensed representation of facts, supported by solid research, on a single sheet of paper displaying, in a tangle of numbers, what holds an entire city together; buildings, areas, and construction supplies as the material basis not only of the built structure but also of an organism of social structures that pervades them—and fills them with meaning. A poetic work awaits visitors in the Grafisches Kabinett. 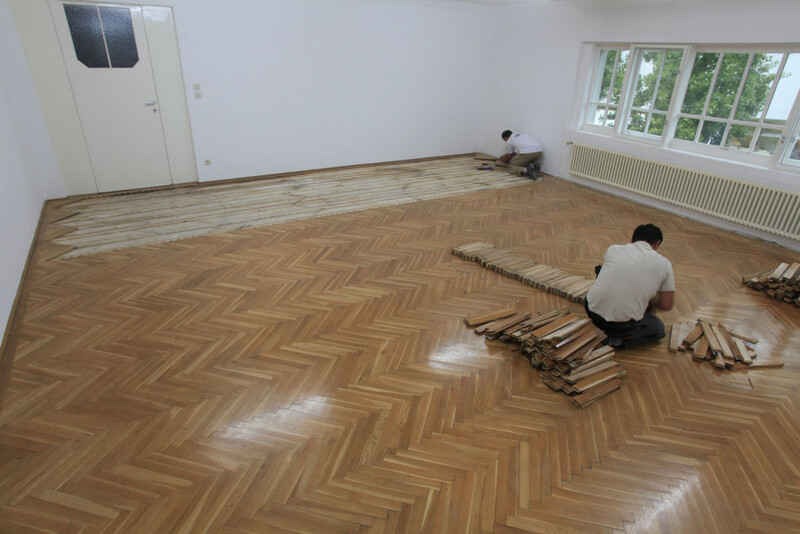 Here, too, the artist has uncovered: in a quiet process concealed from the public, she has performed a Removal of the Wooden Floor / Abtragen des Parkettbodens, Grafisches Kabinett Secession and then reconstructed the floor. “The question was not so much: What can I do to improve a certain place?, but rather: What can I learn from this place?,” the artist says. What remains is the documentation of an almost invisible process and the recognition on the part of visitors that they are at—are standing on—the very scene of this process. Their attention is turned to what underlies it—it is no longer accessible—and to a process that has come to a conclusion and nonetheless remains present. Lara Almarcegui, born in Zaragoza (Spain) in 1972, lives and works in Rotterdam.